wolfgang coming over the bulge just before the first belay on "cascata de lillaz"
Sunday came to a close with clear skies. When we walked home after dinner, the moon was out and there were a few stars in the heavens. On Monday morning, we awoke to steady snow fall with 10-15 cm already on the ground around our pension at 1650 meters. It was forecast to snow throughout the day. 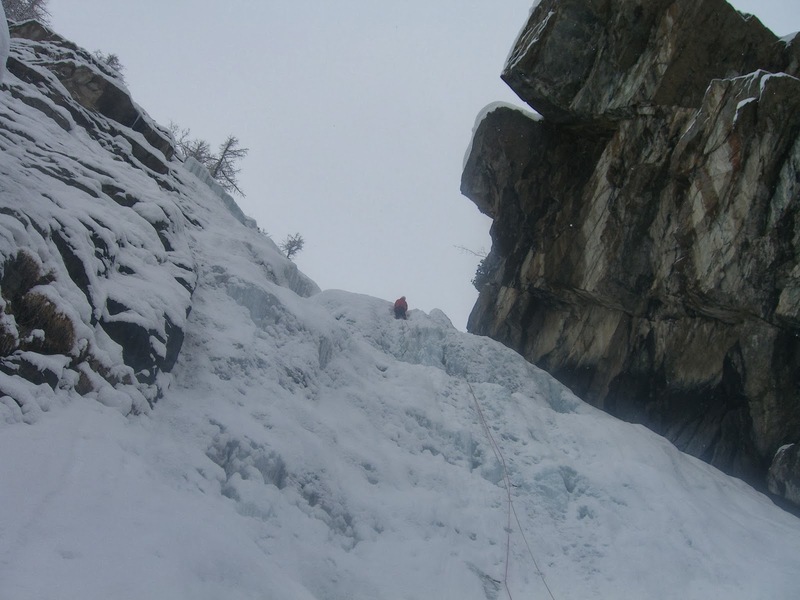 Our plan for the day was to climbed the popular classic route, "Stella Artice", WI5/180m. We were happy to see on the approach that there was only one rope team just starting the first pitch. There would be enough room for us to follow, timing it so that there wouldn't be any problem with falling ice from the two above us. 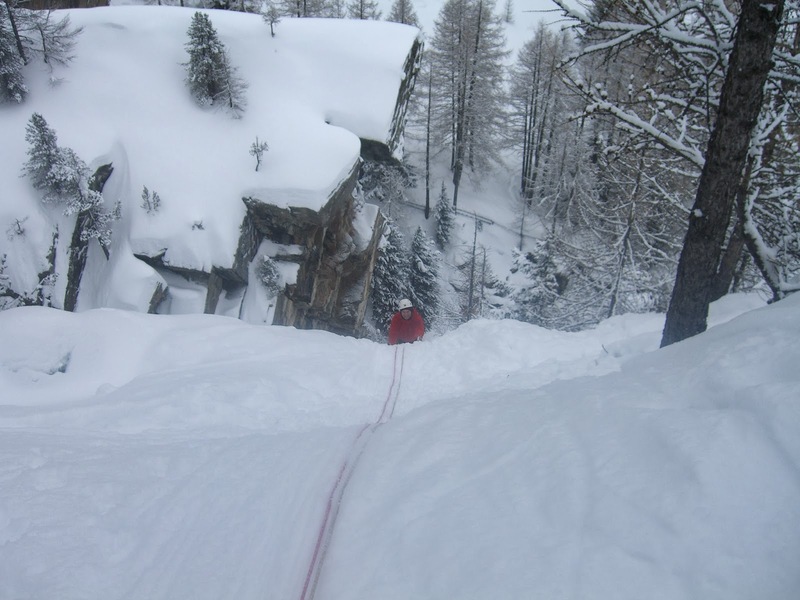 As we were gearing up sheltered by a small rock outcrop, a small spin drift avalanche came down. No big deal, due to the lay of the ice fall I felt we would be okay even with the continuing snow. I was soon proven wrong. A large avalanche released above and came down with a characteristic roar. The air-blown cloud of snow dust preceding the main flow spread out and filled all the crevasses of our clothing and material. The rope team on the first pitch was okay and made a fast retreat and were soon standing next to us. It was an Austrian and German and the Austrian guy was a friend of mine from the Gastein Valley. There is no ice there, so why not come to Cogne? We both spoke of how we wrongly thought the climb would be protected from avalanches. Another slide released. This would probably continue through out the day as the new snow loaded the slopes that rose 1000 meters above the base of the fall. Plan "B" was to climb further right a bit deeper in the valley. That plan was cancelled with the second big slide. Our next idea was to head out of the valley to the climb "Tutto Relativo", WI4/200m. We backed out of the valley and walked up the 100 meter slope to the base of the climb. There were 2 or 3 parties already underway. We put our climbing gear on and were just about ready to start when a group of four snow-covered French climbers came down and explained that a rather large avalanche had come down over the fall. Well, time for another alternative? or should we just head to the cafe for a capochino? We left our crampons on and harnesses on and went to the valley entrance to climb "Cascata de Lillaz", direct WI4/250m. There would only be the danger of too many inexperienced climbers crowding the easily accessible climb. second to last pitch, "cascara de lillaz"
We got in line to start the climb and passed everyone as we moved simultaneously with the rope through the walking sections of the climb. We tried to keep the climb interesting by looking for the steepest ice steps possible. 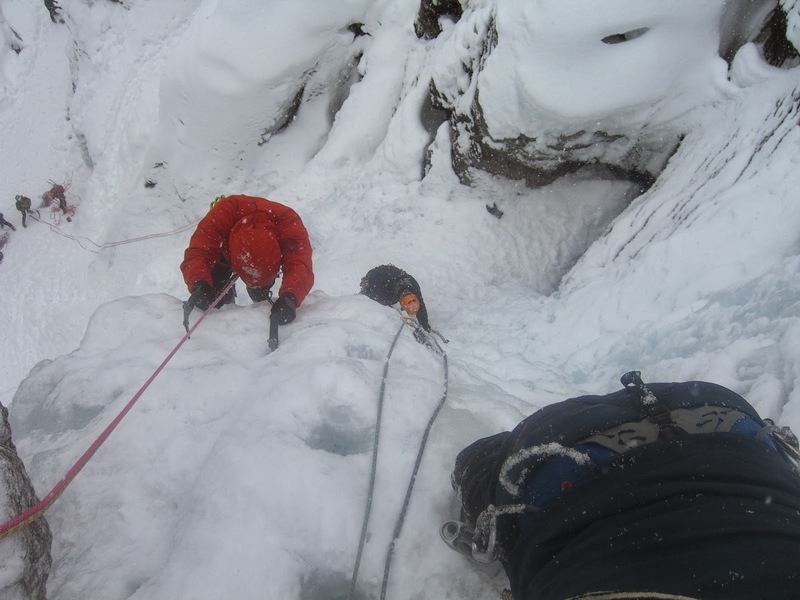 We were one of the few rope teams to climb the full length of the fall that day to complete a long day of trying to find something that wasn't too risky to climb. topping out after 250 meters of "cascara de lillaz"